So, want to save a tree and go virtual? Use one of these three websites to get started. 1. Hashable.com >> This social networking app allows users to “check in” with people to track meetings and calls; exchange business cards by typing in a person’s email address or Twitter handle; and make easy intros by using the hashtag #intro. Other features include sharing digital calendars, scanning in QR codes, and exchanging contacts by holding phones together (think osmosis). Make it real: Hashable, Inc. is located at 6th Avenue and 36th Street in NYC. The website encourages users to “stop by and #sayhi” if they’re in the neighborhood. 2. Cardcloud.com >> Use this app from any phone with Internet connection to share business info with other Cardcloud users (or send via email to non-users). Add notes to a card to spur your memory, or tags to index a person and rate their importance. The “cloud” backs up each card, and integrates smoothly with Twitter and Facebook. Make it real: Not sure where you met someone? Cardcloud stores and displays the geolocation of where you exchanged a business card. This About.me profile boasts just two sentences: one about a background in design, the other about an addiction to beet chips. 3. About.me >> Build a personal profile page that points users to your content from around the web, much like a central hub to build your online identity. 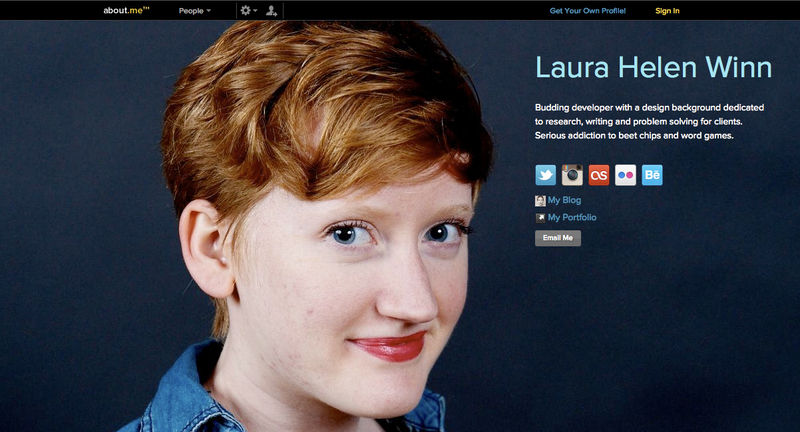 Your personal splash page is heavy on visuals: limit your bio to a few sentences summarizing your current projects. Icons link to your content on various platforms, including Twitter, Facebook, LinkedIn, Tumblr, WordPress, Flickr, Vimeo, YouTube, Formspring, and Instagram. To name a few. LAUNCHING SOON: Look out for Vizualize.me, which promises to “visualize your resume in one click.” Free premium accounts for the first 10,000 sign ups. Voila! Goodbye, Rolodex. No more stacks of cards overflowing from your desk drawers, no more rushing to make reprints. However, in the same Times article, Trapani countered that “you’re real and you have a real job if you have a business card.” Do you think tactile cards still have a certain status attached? Check out other tips & advice from No Joe Schmo, such as ways to maximize your resume and questions to ask at the end of interviews. This entry was posted in Tips & advice and tagged about.me, business cards, cardcloud, gina trapani, hashable, lifehacker, new york times, qr codes, rolodex, sunday styles, vizualize.me by Megan Hess. Bookmark the permalink.